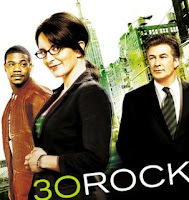 30 ROCK hands down the funniest show on television. Half my friends will disown me on the spot for saying it but... I think it's funnier than The Office. Yea, I said it. If you haven't seen it before, I suggest you immediately netflix (which by the way is another thing I love) seasons 1 and 2 before season 3 starts on October 30th. Tina Fey and Tracy Morgan are great, but seriously, Alec Baldwin is hilarious (even though, let's face it, he's a little crazy). with lines like :"Tracy Jordan: I'm gonna make you a mix tape. You like Phil Collins? Jack: I've got two ears and a heart, don't I?" what's not to love? Definitely check it out.